Brian J. Moore, Ph.D., Claudia A. Steiner, M.D., M.P.H., P. Hannah Davis, M.S., Carol Stocks, Ph.D., R.N., and Marguerite L. Barrett, M.S. Hysterectomy—removal of the uterus—is the second most common surgical procedure among women in the United States, with more than 265,000 hysterectomies performed annually in the inpatient setting.1 Recent research has shown a decrease in the overall rate of hysterectomies and a large increase in the proportion of hysterectomies performed in an outpatient setting.2,3 However, these studies were restricted to either commercially insured women without cancer or women receiving treatment for benign uterine fibroids. This Healthcare Cost and Utilization Project (HCUP) Statistical Brief presents data on hysterectomies and oophorectomies among adult women using all-payer data in two hospital settings: hospital inpatient and hospital-based ambulatory surgery. The analysis is limited to adult women undergoing a hysterectomy, an oophorectomy, or both in combination in five States (Connecticut, Indiana, Kansas, Ohio, and South Carolina) for which hysterectomies and oophorectomies could be identified in both the inpatient and ambulatory surgery settings using International Classification of Diseases, 9th Revision, Clinical Modification (ICD-9-CM) codes.7 These five States represented 9.3 percent of the total U.S. population in 2013. In this Statistical Brief we provide an overview of patient and hospital characteristics for hysterectomies alone, oophorectomies alone, and surgeries when both procedures were performed during the same hospital-based visit—hysterectomy and oophorectomy surgeries "in combination." Trends from 2005 through 2013 in the rates of hysterectomies and oophorectomies, overall and by hospital setting (inpatient and ambulatory surgery), are presented. The distribution in 2013 of surgeries performed by related condition and by age is also provided. Figure 1 presents the number of hospital-based visits for hysterectomy, oophorectomy, or both in combination, and the distribution by hospital setting—inpatient or ambulatory surgery—in five States in 2013. In five States in 2013, there were 65,900 hospital visits in which a hysterectomy, an oophorectomy, or both surgeries were performed. Of these surgeries, 60.4 percent occurred in the outpatient setting. The rate of hysterectomy surgeries (across inpatient and ambulatory surgery settings) decreased 12.3 percent from 2005 to 2013. The trend varied depending on whether an oophorectomy was performed at the same time: the rate increased 14.8 percent when hysterectomy was performed alone and decreased 29.4 percent when the hysterectomy and oophorectomy were combined. The rate of oophorectomy alone decreased 11.9 percent from 2005 to 2013. In five States in 2013, 26,400 hysterectomy and oophorectomy surgeries were performed during the same hospital-based visit. These surgeries performed in combination were done slightly more often in the inpatient setting (53 percent) than in the outpatient setting (47 percent). In five States, benign neoplasms and other gynecological and maternal conditions were the most common conditions related to hysterectomy and oophorectomy surgeries in 2013. Regardless of the condition related to the surgery, women aged 55 years and older were more likely to have oophorectomy and hysterectomy surgeries performed in combination. 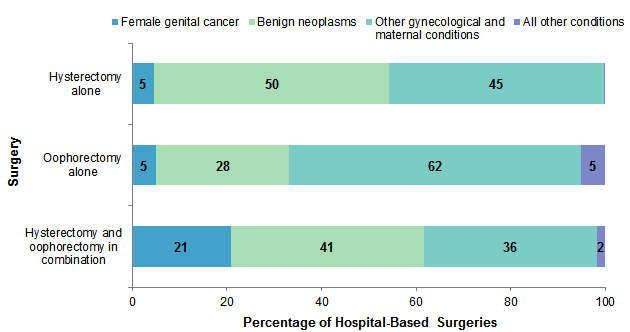 Stacked bar chart showing the distribution of hysterectomy and oophorectomy, alone and in combination, by hospital setting in 2013. Hysterectomy alone: total 27,000; inpatient, 8,300 stays, 30.7%; hospital-based ambulatory surgery, 18,700 visits, 69.3%. Oophorectomy alone: total 12,500; inpatient, 3,800 stays, 30.4%; hospital-based ambulatory surgery, 8,700 visits, 69.6%. Hysterectomy and oophorectomy combined: total 26,400; inpatient, 14,000 stays, 53.0%; hospital-based ambulatory surgery, 12,400 visits, 47.0%. Only 19 percent of inpatient hospitalizations involving hysterectomy, oophorectomy, or both in combination in 2013 were for oophorectomy alone (with no hysterectomy). Of 65,900 hospital visits involving hysterectomy, oophorectomy, or both in combination in 2013, 27,000 hospital visits involved only a hysterectomy (41.0 percent), 26,400 hospital visits involved both a hysterectomy and an oophorectomy in combination (40.1 percent), and 12,500 hospital visits involved only an oophorectomy (19.0 percent). Combined hysterectomy and oophorectomy surgeries were performed more often in the inpatient setting, whereas hysterectomy or oophorectomy surgeries performed alone took place more frequently in the outpatient setting. 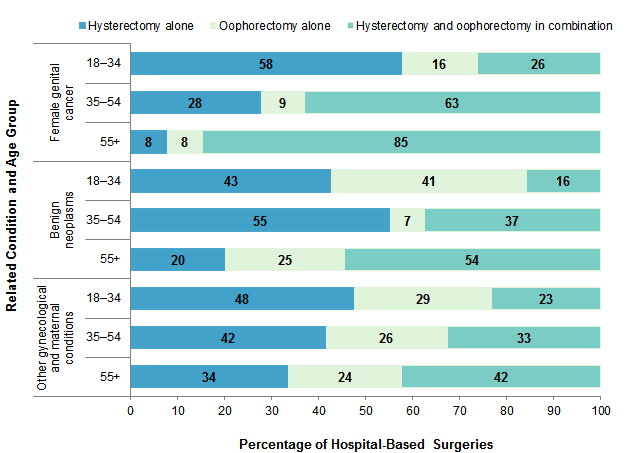 Table 1 presents characteristics related to hysterectomy and oophorectomy surgeries comparing surgeries performed in the hospital inpatient setting with those performed in the hospital-based ambulatory surgery setting in 2013.
a The denominator for rates is the age- and race-specific female resident population aged 18 years and older in the five States. b Other race/ethnicity includes Asian/Pacific Islander, American Indian, and Alaskan Native. c We report hospital charges rather than costs because Cost-to-Charge Ratios are not available for ambulatory surgery data. Women aged 35-54 years had the highest rates of hysterectomy or oophorectomy surgeries per 100,000 women, both alone and in combination, in both inpatient and hospital-based ambulatory surgery settings. Women aged 35-54 years had the highest rates of hysterectomy or oophorectomy alone or in combination in both the inpatient and ambulatory surgery settings in 2013. The rates of hysterectomy alone for women aged 35-54 years were 152.4 and 338.6 per 100,000 women in the inpatient and ambulatory surgery settings, respectively. The rates of oophorectomy alone for women aged 35-54 years were 40.2 and 121.7 per 100,000 women in the inpatient and ambulatory surgery settings, respectively. The rates of hysterectomy and oophorectomy surgeries in combination for women aged 35-54 years were 189.9 and 191.4 per 100,000 women in the inpatient and ambulatory surgery settings, respectively. The highest rate for women aged 18-34 years was 96.3 per 100,000 women for hysterectomy alone in the ambulatory surgery setting. The highest rate for women aged 55 years and older was 128.7 per 100,000 women for hysterectomy and oophorectomy surgeries in combination in the inpatient setting. Black women had the highest rates of hysterectomy in both the inpatient and ambulatory settings. Black women had the highest rates of oophorectomy and oophorectomy and hysterectomy in combination in the inpatient setting only. In 2013, Black women had the highest rate of inpatient surgeries for all three types of surgery and the highest rate of hysterectomy alone in the ambulatory surgery setting. For example, the rate of inpatient hysterectomy for Black women (143.7 per 100,000) was more than 2 times higher than for White (58.0 per 100,000) and Hispanic (69.2 per 100,000) women. White women had the highest rate of hospital-based ambulatory surgeries for oophorectomy alone (76.2 per 100,000) and hysterectomy and oophorectomy surgeries in combination (113.4 per 100,000) in 2013. For combined hysterectomy and oophorectomy, the rate for White women was more than twice as high as for Black (55.3 per 100,000) and Hispanic (36.5 per 100,000) women. In contrast, Hispanic women had the lowest rate for all procedures except for inpatient hysterectomy (69.2 per 100,000), which was slightly higher than the rate for White women (58.0 per 100,000) but still lower than that for Black women (143.7 per 100,000). Private insurance accounted for the largest proportion of both inpatient and hospital-based ambulatory surgery visits with hysterectomy or oophorectomy or both in combination. Private insurance was the expected primary payer for 70.2 percent of hospital-based ambulatory surgery visits with hysterectomy alone, 64.6 percent for oophorectomy alone, and 68.8 percent for combined hysterectomy and oophorectomy—covering more than 4 times as many hospital-based ambulatory surgery visits as the second most frequent payer for each type of surgery. Private insurance also accounted for the largest proportion of hospital inpatient stays with hysterectomy or oophorectomy or both in combination for each type of surgery. Medicare covered 26.3 percent of inpatient stays with oophorectomy alone and 23.6 percent of combined hysterectomy/oophorectomy inpatient stays. Medicaid was the expected primary payer for more than 10 percent of hysterectomy or oophorectomy procedures or both in combination for all three types of surgeries in both settings. Inpatient hospital stays for oophorectomy alone had the longest mean length of stay and highest mean hospital charges. Outpatient hospital visits for oophorectomy alone had the lowest mean hospital charges. Inpatient stays with an oophorectomy alone had a mean length of stay of 4.7 days and mean hospital charges of $49,300 in 2013. By comparison, inpatient stays with hysterectomy alone and with hysterectomy and oophorectomy in combination had mean lengths of stay of 2.3 days and 3.2 days, respectively, and mean hospital charges of $33,400 and $41,900, respectively. Mean hospital charges for outpatient oophorectomy alone were $22,500 in 2013 compared with $30,000 and $32,800 for outpatient hysterectomy alone and outpatient hysterectomy and oophorectomy surgeries in combination, respectively. 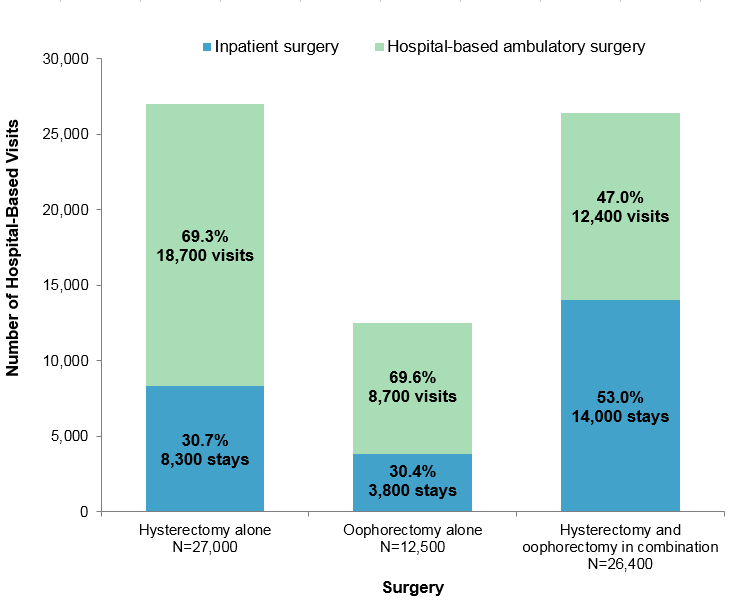 Figure 2 presents trends in the rates of hysterectomy and oophorectomy surgeries from 2005 through 2013 for inpatient and ambulatory surgery settings collectively. Note: Inpatient and ambulatory surgery settings have been added together in this figure. Line graph showing the number of hysterectomy and oophorectomy surgeries, alone and in combination, per 100,000 adult women, 2005-2013. Combined hysterectomy and oophorectomy: 2005, 323.2; 2007, 293.5; 2009, 290.6; 2011, 254.4; 2013, 228.2—a 29.4% decrease. Oophorectomy alone: 2005, 123.1; 2007, 118,1; 2009, 127.3; 2011, 116.2; 2013, 108.4—a 11.9% decrease. Hysterectomy alone: 2005, 203.5; 2007, 214.3; 2009, 242.1; 2011, 246.8; 2013, 233.6—a 14.8% increase. The rate of hysterectomy alone increased from 2005 to 2013, whereas the rates of oophorectomy alone and combined hysterectomy/oophorectomy decreased. Across both hospital inpatient stays and hospital-based ambulatory surgeries, the rate of hysterectomy alone increased 14.8 percent from 2005 to 2013 (from 203.5 to 233.6 hospital visits per 100,000 adult women). During the same time period, the rate of hospital-based surgery for oophorectomy alone decreased 11.9 percent (from 123.1 to 108.4 hospital visits per 100,000 adult women). The rate of hospital-based surgery for hysterectomy and oophorectomy surgeries in combination decreased 29.4 percent (from 323.2 to 228.2 hospital visits per 100,000 adult women). Although the rate of hysterectomy alone increased, when all hysterectomies were examined (including those with oophorectomy), there was a decline from 2005 to 2013. Across both hospital inpatient stays and hospital-based ambulatory surgeries, the rate of hysterectomy surgeries decreased 12.3 percent from 2005 to 2013 from 526.7 (rate of 323.2 in combination + 203.5 alone) to 461.8 (rate of 228.2 in combination + 233.6 alone) hospital visits per 100,000 adult women (calculation not shown in figure). The rate of oophorectomy surgeries decreased 11.9 percent from 2005 to 2013 from 446.3 (rate of 323.2 in combination + 123.1 alone) to 336.6 (228.2 in combination + 108.4 alone) hospital visits per 100,000 adult women (calculation not shown in figure). Table 2 breaks down trends from Figure 2 across the hospital inpatient and ambulatory surgery settings from 2005 through 2013. The overall rate of hospital inpatient stays for hysterectomy and oophorectomy surgeries, alone and in combination, per 100,000 adult women steadily decreased from 2005 to 2013. Inpatient stays for hysterectomies alone decreased from 172.1 per 100,000 adult women in 2005 to 72.1 per 100,000 adult women in 2013, a 58.1 percent decrease and an average annual percentage decrease of 10.3. Inpatient stays for oophorectomy alone decreased from 67.3 per 100,000 adult women in 2005 to 33.1 per 100,000 adult women in 2013—a 50.8 percent decrease and an average annual percentage decrease of 8.5 percent. Inpatient stays for hysterectomy and oophorectomy surgeries in combination decreased from 294.7 per 100,000 adult women in 2005 to 121.2 per 100,000 adult women in 2013, a 58.9 percent decrease and an average annual percentage decrease of 10.5 percent. The rate of hospital-based ambulatory surgeries for hysterectomy and oophorectomy, alone and in combination, steadily increased from 2005 to 2013. Ambulatory surgeries for hysterectomy alone increased from 31.4 per 100,000 adult women in 2005 to 161.6 per 100,000 adult women in 2013, a 414.4 percent increase and an average annual percentage increase of 22.7. Ambulatory surgeries for oophorectomy alone increased from 55.8 per 100,000 adult women in 2005 to 75.3 per 100,000 adult women in 2013, a 35.0 percent increase and an average annual percentage increase of 3.8. Ambulatory surgeries for hysterectomy and oophorectomy surgeries in combination increased from 28.5 per 100,000 adult women in 2005 to 107.0 per 100,000 adult women in 2013—a 275.9 percent increase and an average annual percentage increase of 18.0. Hospital inpatient stays and hospital-based ambulatory surgery visits were grouped using the most frequent conditions related to the surgeries. Three related condition groups were defined on the basis of their association with hysterectomy and oophorectomy—female genital cancer, benign neoplasms (e.g., leiomyoma or uterine fibroids), and other gynecological and maternal conditions (e.g., endometriosis, menstrual disorders, menopausal disorders, ectopic pregnancy, prolapse of female genital organs).8 A fourth residual category comprised all other conditions, which included abdominal pain or hernia, diverticulosis, and other gastrointestinal disorders. Figure 3 presents the distribution of groups of conditions most frequently related to hysterectomy and oophorectomy in 2013. Notes: Inpatient and ambulatory surgery settings have been added together in this figure. Surgeries are classified into related condition groups using all-listed diagnoses. Stacked bar chart showing the distribution of conditions frequently related to hysterectomy and oophorectomy surgeries, alone or in combination. Hysterectomy alone: female genital cancer, 5%; benign neoplasms, 50%; other gynecological and maternal conditions, 45%. Oophorectomy alone: female genital cancer, 5%; benign neoplasms, 28%; other gynecological and maternal conditions, 62%; all other conditions, 5%. Hysterectomy and oophorectomy in combination: female genital cancer, 21%; benign neoplasms, 41%; other gynecological and maternal conditions, 36%; all other conditions, 2%. Benign neoplasms and other gynecological and maternal conditions were the most common related conditions for hysterectomy and oophorectomy in 2013. Benign neoplasms were the most common conditions for hysterectomy, alone and in combination with oophorectomy, representing 50 percent of hysterectomy alone, 28 percent of oophorectomy alone, and 41 percent of hysterectomy and oophorectomy in combination. Other gynecological and maternal conditions were the most common related conditions for oophorectomy alone in 2013, at 62 percent. Other gynecological and maternal conditions also represented 45 percent of hysterectomy alone and 36 percent of hysterectomy and oophorectomy in combination. Female genital cancer was the related condition in just 5 percent of hysterectomy and oophorectomy alone but represented 21 percent of hysterectomy and oophorectomy in combination. Other remaining conditions, which included abdominal pain or hernia, diverticulosis, and other gastrointestinal disorders, represented less than 1 percent of conditions related to hysterectomy alone, 5 percent of oophorectomy alone, and 2 percent of hysterectomy and oophorectomy in combination. Figure 4 presents the distribution of hysterectomy and oophorectomy by related condition and age group in 2013. Stacked bar chart showing the distribution of hysterectomy and oophorectomy, alone and in combination, by related condition and age group. Female genital cancer: 18-34 years—58% hysterectomy alone; 16% oophorectomy alone; 26% hysterectomy and oophorectomy in combination; 35-54 years—28% hysterectomy alone; 9% oophorectomy alone; 63% hysterectomy and oophorectomy in combination; 55+ years—8% hysterectomy alone; 8% oophorectomy alone; 85% hysterectomy and oophorectomy in combination. Benign neoplasms: 18-34 years—43% hysterectomy alone; 41% oophorectomy alone; 16% hysterectomy and oophorectomy in combination; 35-54 years—55% hysterectomy alone; 7% oophorectomy alone; 37% hysterectomy and oophorectomy in combination; 55+ years—20% hysterectomy alone; 25% oophorectomy alone; 54% hysterectomy and oophorectomy in combination. Other gynecological and maternal conditions: 18-34 years—48% hysterectomy alone; 29% oophorectomy alone; 23% hysterectomy and oophorectomy in combination; 35-54 years—42% hysterectomy alone; 26% oophorectomy alone; 33% hysterectomy and oophorectomy in combination; 55+ years—34% hysterectomy alone; 24% oophorectomy alone; 42% hysterectomy and oophorectomy in combination. Women aged 55 years and older were less likely to have a hysterectomy alone and more likely to have a hysterectomy and oophorectomy in combination in 2013 across all three related conditions. Regardless of the related conditions, women aged 55 years and older were less likely to have a hysterectomy alone and more likely to have a hysterectomy and oophorectomy in combination during the same hospital-based visit. Among women aged 55 years and older with a female genital cancer diagnosis, 85 percent had a hysterectomy and oophorectomy performed in combination. Among women aged 55 years and older with benign neoplasms or other gynecological and maternal conditions, 54 and 42 percent, respectively, had a hysterectomy and oophorectomy performed in combination. Women under age 55 years with other gynecological and maternal conditions were more likely to have a hysterectomy alone compared with either an oophorectomy alone or hysterectomy and oophorectomy surgeries in combination. Among women aged 18-34 years and 35-54 years with other gynecological and maternal conditions, 48 and 42 percent, respectively, had a hysterectomy alone. As women with other gynecological and maternal conditions became older, an increasing proportion had hysterectomy and oophorectomy surgeries in combination: 23 percent among women aged 18-34 years, 33 percent among women aged 35-54 years, and 42 percent among women aged 55 years and older. Women aged 18-34 years with female genital cancer were more likely to have a hysterectomy alone than to have an oophorectomy, either alone or in combination with a hysterectomy. Among women with female genital cancer, 18-34-year-olds were more likely to have a hysterectomy alone (58 percent) than an oophorectomy (16 percent for oophorectomy alone and 26 percent for hysterectomy and oophorectomy in combination). Over 40 percent of women aged 18-34 years with related benign neoplasms had an oophorectomy alone. Among women aged 18-34 years with a hysterectomy and/or oophorectomy and a related condition of benign neoplasms, 43 percent had a hysterectomy alone and 41 percent had an oophorectomy alone. In contrast, among women aged 35-54 years with related benign neoplasms, 55 percent had a hysterectomy alone and just 7 percent had an oophorectomy alone. The volumes and rates in this Statistical Brief are based upon data from the Healthcare Cost and Utilization Project (HCUP) 2013 State Inpatient Databases (SID) and State Ambulatory Surgery and Services Databases (SASD). This report evaluates inpatient and outpatient surgery data from five States that contributed to the 2013 SID and 2013 SASD: Connecticut, Indiana, Kansas, Ohio, and South Carolina. Historical data were drawn from the same five States in the 2005, 2007, 2009, and 2011 SID and SASD. Analysis was limited to hospitals within the five States that had cases in the inpatient and ambulatory surgery settings in each data year. States were included only if they provided complete outpatient procedure coding that would allow the identification of outpatient procedures by International Classification of Diseases, Ninth Revision, Clinical Modification (ICD-9-CM) procedure codes. Identification of these surgeries using Current Procedural Terminology (CPT®) procedure codes was not possible because of ambiguity in the reporting of oophorectomy procedures. The principal diagnosis is that condition established after study to be chiefly responsible for the patient's hospital inpatient stay or outpatient visit. Secondary diagnoses are concomitant conditions that coexist at the time of the admission or visit or that develop during the stay. Hospital discharge and ambulatory surgery records with a hysterectomy or oophorectomy were defined based on all-listed procedure codes as identified using the CCS categories for ICD-9-CM procedures. The hysterectomy and oophorectomy in combination category required procedures from both CCS categories on the same hospital-based visit. The CCS category defining hysterectomy is 124, Hysterectomy; abdominal and vaginal. The CCS category defining oophorectomy is 119, Oophorectomy; unilateral and bilateral. The related conditions for hospital visits presented in Figures 3 and 4 were defined on the basis of the ICD-9-CM and CCS diagnosis codes in Table 3. Each related condition was defined using all-listed diagnoses (i.e., the principal diagnosis and up to 24 secondary diagnoses). The assignment was based on a hierarchy that first looked for the presence of a female genital cancer diagnosis, then benign neoplasms, then other gynecological and maternal conditions, and finally all other conditions. All other conditions All other diagnoses including but not limited to cancer of breast (CCS category 24), cancer of colon (CCS category 14), other gastrointestinal disorders (CCS category 155), abdominal pain (CCS category 251), and diverticulosis and diverticulitis (CCS category 146). Abbreviations: CCS, Clinical Classifications Software; ICD-9-CM, International Classification of Diseases, Ninth Revision, Clinical Modification; OB, obstetric. This analysis used State Inpatient Databases (SID) limited to data from community hospitals, which are defined as short-term, non-Federal, general, and other hospitals, excluding hospital units of other institutions (e.g., prisons). Community hospitals include obstetrics and gynecology, otolaryngology, orthopedic, cancer, pediatric, public, and academic medical hospitals. Excluded for this analysis are long-term care facilities such as rehabilitation, psychiatric, and alcoholism and chemical dependency hospitals. However, if a patient received long-term care, rehabilitation, or treatment for a psychiatric or chemical dependency condition in a community hospital, the discharge record for that stay was included in the analysis. The analysis was limited to hospitals that had at least one hysterectomy or oophorectomy performed in both the SID and the SASD in each data year. This analysis used State Ambulatory Surgery and Services Databases (SASD) limited to data from hospital-owned ambulatory surgery facilities. Although some SASD include data from facilities not owned by a hospital, those facilities were excluded from this analysis. The designation of a facility as hospital-owned is specific to its financial relationship with a hospital that provides inpatient care and is not related to its physical location. Ambulatory surgery performed in hospital-owned facilities may be performed within the hospital, in a facility attached to the hospital, or in a facility physically separated from the hospital. The analysis was further limited to ambulatory surgeries performed at facilities owned by community hospitals. Community hospitals are defined as short-term, non-Federal, general, and other specialty hospitals, excluding hospital units of other institutions (e.g., prisons). The analysis was limited to hospitals that had at least one hysterectomy or oophorectomy performed in both the SID and the SASD in each data year. The unit of analysis is the hospital discharge (i.e., the hospital stay) for an inpatient stay or ambulatory surgery, not a person or patient. This means that a person who is admitted to the hospital to have surgery multiple times in 1 year will be counted each time as a separate discharge from the hospital. Data on Hispanic ethnicity are collected differently among the States and also can differ from the Census methodology of collecting information on race (White, Black, Asian/Pacific Islander, American Indian/Alaska Native, Other (including mixed race)) separately from ethnicity (Hispanic, non-Hispanic). State data organizations often collect Hispanic ethnicity as one of several categories that include race. Therefore, for multistate analyses, HCUP creates the combined categorization of race and ethnicity for data from States that report ethnicity separately. When a State data organization collects Hispanic ethnicity separately from race, HCUP uses Hispanic ethnicity to override any other race category to create a Hispanic category for the uniformly coded race/ethnicity data element, while also retaining the original race and ethnicity data. All of the States included in the analyses for this Statistical Brief report Hispanic ethnicity. This Statistical Brief reports race/ethnicity for the following categories: Hispanic, non-Hispanic White, non-Hispanic Black, and non-Hispanic Other (includes non-Hispanic Asian/Pacific Islander and non-Hispanic American Indian/Alaska Native). The HCUP State Ambulatory Surgery and Services Databases (SASD) include encounter-level data for ambulatory surgeries and may also include various types of outpatient services such as observation stays, lithotripsy, radiation therapy, imaging, chemotherapy, and labor and delivery. The specific types of ambulatory surgery and outpatient services included in each SASD vary by State and data year. All SASD include data from hospital-owned ambulatory surgery facilities. In addition, some States include data from facilities not owned by a hospital. The designation of a facility as hospital-owned is specific to its financial relationship with a hospital that provides inpatient care and is not related to its physical location. Hospital-owned ambulatory surgery and other outpatient care facilities may be contained within the hospital, physically attached to the hospital, or located in a different geographic area. This analysis was restricted to hospital-owned ambulatory surgery. For other information on women's health, including hysterectomies, refer to the HCUP Statistical Briefs located at http://www.hcup-us.ahrq.gov/reports/statbriefs/sb_womens.jsp. Moore BJ (Truven Health Analytics), Steiner CA (AHRQ), Davis PH (AHRQ), Stocks C (AHRQ), Barrett ML (M.L. Barrett, Inc.). Trends in Hysterectomies and Oophorectomies in Hospital Inpatient and Ambulatory Settings, 2005-2013. HCUP Statistical Brief #214. November 2016. Agency for Healthcare Research and Quality, Rockville, MD. 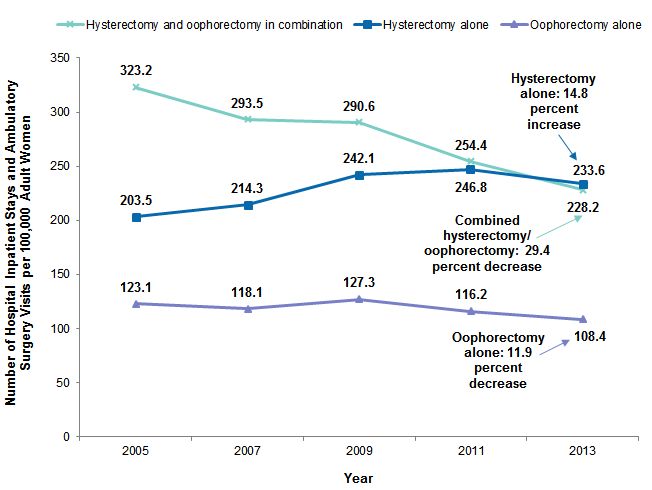 http://www.hcup-us.ahrq.gov/reports/statbriefs/sb214-Hysterectomy-Oophorectomy-Trends.pdf. The authors would like to acknowledge the contributions of Minya Sheng and Cary Rizor of Truven Health Analytics and Anne Casto of The Ohio State University. This Statistical Brief was posted online on November 29, 2016. 1 HCUPnet. Healthcare Cost and Utilization Project (HCUP). 2013. Agency for Healthcare Research and Quality, Rockville, MD. http://hcupnet.ahrq.gov/. Accessed June 23, 2016. 2 Barrett ML, Weiss AJ, Stocks C, Steiner CA, Myers ER. Procedures to Treat Benign Uterine Fibroids in Hospital Inpatient and Hospital-Based Ambulatory Surgery Settings, 2013. HCUP Statistical Brief #200. January 2016. Agency for Healthcare Research and Quality, Rockville, MD. http://www.hcup-us.ahrq.gov/reports/statbriefs/sb200-Procedures-Treat-Uterine-Fibroids.pdf. Accessed October 17, 2016. 3 Doll KM, Dusetzina SB, Robinson W. Trends in inpatient and outpatient hysterectomy and oophorectomy rates among commercially insured women in the United States, 2000-2014. JAMA Surgery. 2016;151(9):876-7. 4 HCUPnet, 2013. Op. cit. 5 Jacoby VL, Grady D, Wactawski-Wende J, Manson JE, Allison MA, Kuppermann M, et al. Oophorectomy vs ovarian conservation with hysterectomy: cardiovascular disease, hip fracture, and cancer in the Women's Health Initiative Observational Study. Archives of Internal Medicine. 2011;171(8):760-8. 6 Doll KM et al., 2016. Op. cit. 7 Only ICD-9-CM procedure coding was used. Identification of these surgeries using Current Procedural Terminology (CPTÂ®) procedure codes was not possible because of ambiguity in the reporting of oophorectomy procedures when a hysterectomy is performed. Some CPT codes for hysterectomy may or may not also include an oophorectomy. 8 For more details, see Case Definition Table 3 in the Definitions section. 9 Barrett M, Hickey K, Coffey R, Levit K. Population Denominator Data for Use with the HCUP Databases (Updated with 2014 Population Data). HCUP Methods Series Report #2015-07. September 1, 2015. U.S. Agency for Healthcare Research and Quality. http://hcup-us.ahrq.gov/reports/methods/2015-07.pdf. Accessed February 17, 2016. 10 Agency for Healthcare Research and Quality. HCUP Clinical Classifications Software (CCS). Healthcare Cost and Utilization Project (HCUP). Rockville, MD: Agency for Healthcare Research and Quality. Updated June 2015. http://www.hcup-us.ahrq.gov/toolssoftware/ccs/ccs.jsp. Accessed February 17, 2016. Internet Citation: Statistical Brief #214. Healthcare Cost and Utilization Project (HCUP). November 2016. Agency for Healthcare Research and Quality, Rockville, MD. www.hcup-us.ahrq.gov/reports/statbriefs/sb214-Hysterectomy-Oophorectomy-Trends.jsp.